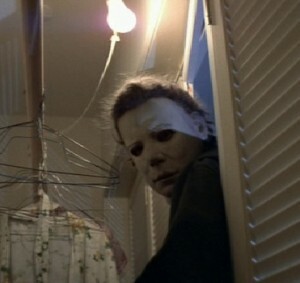 It’s no secret that John Carpenter’s 1978 groundbreaking horror masterpiece Halloween is in my top 10, if not at the top, for my favorite horror movie of all time. I had to change my pants on a few occasions as a child after getting a glimpse of Michael Myers in that William Shatner mask, and to this day it still freaks me out (not the ones that were in the many sequels to follow though….so terrible). Now in addition to the unsettling atmosphere and soundtrack, there were some unintentional or maybe intentional comic relief moments to ease a little of that terror filled tension.